In catching up with old friends in Melbourne, I have noticed a curious trend. Ordinarily, when one catches up with old friends after being overseas for an extended period, one is asked mostly about where one has been, what one did while there, and was it was like. While I was, expectedly, bombarded with those questions, I was struck by something else that I was asked for a lot – advice on physical training. Unbeknownst to me, it seems that being a full-time athlete makes me an ideal candidate for being asked about all things relating to physical training, the assumption here being that I am somehow very knowledgeable about it. While I am fairly knowledgeable when it comes to matters of training, that should not be an obvious thing. Not all (in fact, very few) athletes know much about the science behind their training schedules. I suppose my friends also assumed that, being the sort of person who I am, I would have taken the time to learn about the science behind the training. While this happens to be true, the information in my head is not as useful as a lot of people seem to think. Let me begin by saying that I’m not a naturally sporty person. That might sound absurd, given that I have been involved in a great many sports, some at a fairly competitive level. A phrase I have recently used a lot is that I have been the fortunate winner of some kind of “genetic lottery”. It is well-known among my friends that I eat ridiculous amounts of food and never seem to put on any weight. What is less well-known is that this isn’t because I lead an active lifestyle. While I lived in New York doing my masters degree, I did almost no exercise. I always took the subway from my apartment on 86th St to uni, on 116th, which is about 20-30 minutes worth of walking. I still ate copious amounts of food, yet I neither gained weight, nor did I have the appearance of gaining weight. I did the occasional push up and sit-up for merely cosmetic purposes, in preparation for the unlikely scenario that a girl should find herself in my apartment requesting an inspection of the muscles in question. It was only after I finished the actual degree and I found myself with a lot of free time, did the thought of exercise even cross my mind. I would then run a lap of central park just for fun, or play some indoor soccer or table tennis. An unusual thing that I noticed was that, despite not having done any training for almost a year, I was still a great deal fitter and stronger than most of the people who also participated in these activities. Moreover, most of these people were regular and long-term participants in those activities. Genetics – mere luck – determine a great deal about one’s sporting prowess, and this is especially apparent at the elite level. It is also apparent, if one knows what one is looking for, at the lower levels of sport. This is something to keep in mind, when considering any advice I give relating to sport. Often I am asked to give advice on what training needs to be done for “general fitness”. This question baffles me. For me, sport is a tool; a means to an end. Most of the time for me, that end is just to have fun and be social. Recently, I had a go at making the Olympic games that end, but it didn’t quite work out. The notion that there are people out there who, by themselves, for no other reason than “general fitness” go out for runs and to the gym confuses me slightly. I often ask “what’s your goal?” to which I am usually met with the reply “just to get fit” at which point my head explodes in confusion. But this is silly. It seems ridiculous that someone who has spent as much time in as many different sports as I have, and as much time training at a high level as I have can offer no help to the hapless seeker of information on how to be “generally fit”. Without clear goals (and by “clear goals” what I really mean is, “which olympic event are you trying to win?”) it is difficult for me to dispense responsible advice. However, in my meandering experience and observation, I have witnessed a great many people in their quest for “general fitness” doing things wrong. Is this a bad thing? My previous argument included matters such as risk of injury, however I have since realized that since they are not full time athletes, doing things badly just occasionally doesn’t do them enough harm to properly inconvenience them, and by “properly inconvenience”, I mean “injure themselves in a way that they would notice, and would impair their ability to train further”. Nevertheless, I will now attempt to give advice (hence the title of this post) on how one might go about achieving their goal of “general fitness” without attracting the ire of people such as myself. Firstly a word about technique. It is the first and last thing you should be thinking about whenever you do sport. There is hardly space in this article to go into any real detail about biomechanics so I won’t. Instead, my advice is to observe people who are at the top of whatever sport you happen to be doing and do what they do. Proper technique is the key to realizing your full potential in any given sport. Even if you do not have Olympic aspirations, proper technique is also a good way to avoid injury. In everything you do, there exists such a thing as “proper technique”. Some people have an ability to watch people and then copy their technique well, while others can “feel” their way towards good technique (talented swimmers do this). Get a coach, get a mirror, get a stopwatch… do whatever it takes, but make absolutely sure that you are ALWAYS thinking about doing things with proper technique. Have fun – many people forget this. Many people also forget that fun can take many different forms. Playing a team sport like hockey for example can be fun for the social aspect, sports like orienteering can be fun for the exposure to beautiful scenery and nature (and bears). For those who just go to the gym, perhaps it is a good time to catch up on all the latest lectures from iTunes U, or to take a survey on the correlation between female buttock diameter and bench press ability. It can even be as inane as wanting to socialize with hot female curlers after a curling match. Whatever you can do to make it fun, do it because if you’re not enjoying yourself, then you’re not going to be motivated, and being motivated is important for all those instances when you don’t really want to wake up to go training because it’s too cold, wet, or early in the afternoon. What I’m going to focus on takes its cues sports-science-wise from the early part of a training program. This is the part where an athlete has just come back from a long break and is simply preparing the body for “proper” training. At this point, a lot of people are thinking “why don’t we just get straight into proper training”. The simple answer to that is that it might kill you, and it would certainly injure you in a way akin to taking one step forward and about ten steps back (starting from zero, mind you). If you eventually want to get into “proper” training, then it’s up to you but I would generally advise against it unless you really want to go to the Olympics. Past a certain volume of training, there are rapidly decreasing returns, and past a *slightly* further point, it will do more harm than good. One of the challenges of a high performance coach, is to find that maximum amount of training that a body can take and do the most with it. Athletes chosen for this kind of thing are often considered for their ability to withstand and recover from high volumes and intensities of training. A quick word on eating – eat well. Drink LOTS, in fact, carry a water bottle around with you wherever you go and sip from it regularly. Don’t go crazy trying to avoid every little thing that has fat in it. Do NOT go out and buy all the low-fat and sugar-free food in the supermarket. Avoid processed foods as much as possible. Think of it this way – if it has been processed, then your body has to un-process it to get to it. While your body is busy doing that, it also has to clean out all the stuff that isn’t “food”, like preservatives, colouring, etc. That’s all effort that is being wasted, and effort that your body was never designed to go through. You should try very hard to eat something within 20 minutes of finishing a workout because your body absorbs things faster while it is in that heightened state. If you can stomach it, nibbling during a workout is also recommended (as a practical note, I’ve only been able to make that work on long bike rides). Your cardiovascular system is important for obvious reasons. In sport, even in sports which emphasize sprinting over endurance (shot put, to take an extreme example) a well trained CV system is important because it helps you recover from training. My general feeling about this, is to do something that is as low-impact as possible. Cycling and swimming are options that come to mind, and which of these you choose depends largely on which is closer to the sport you are training for. 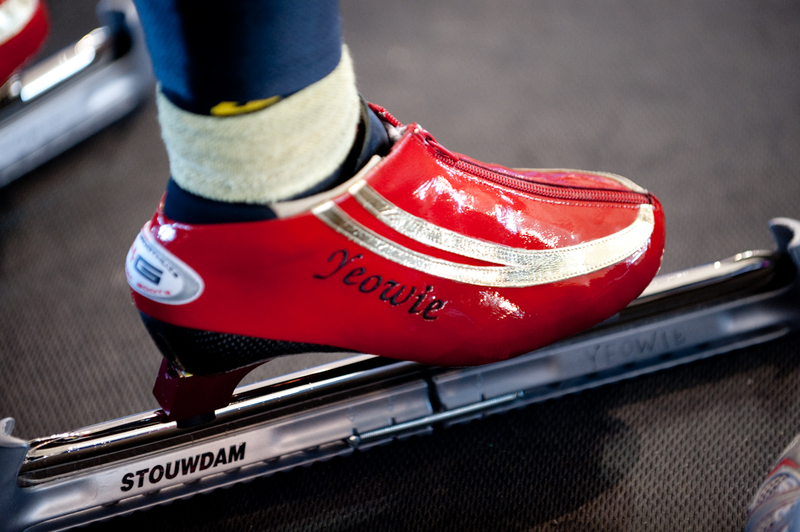 For a sport like speed skating, cycling is perfect because not only is it low impact, but it also works very similar muscle groups to those used in skating. Swimming is a better all-round workout and doesn’t usually require as much space. (you could always put your bike on a wind-trainer, or use a stationary bike I suppose). If your chosen sport is an endurance-heavy sport, like cross country running, then running is another option. Running however, is quite high-impact and requires more recovery time, and this should be kept in mind when designing your own program. Specifically, every workout you do will train your CV system to some extent. It is helpful though, to have at least one session a week which targets it specifically. When I trained, it was a 3-hour bike ride every Sunday afternoon in a large pack. Of course, this is in the context of a training week where we would often do an easy hour on the bike in the late afternoon of every day for “recovery”. If you’re on a bike, you’ll need more time than if you’re swimming, and if you’re running, try not to go for more than 45 minutes otherwise you’ll food-flat. Work on your flexibility. You don’t have to be able to do the splits to be good at speed skating (although, if you’re a figure skater, it really helps) but having a good range of motion is very important not only for injury prevention, but for your own awareness of where bits of your own body are. Stretching for flexibility involves lengthening the muscle to its limit for about 20-30 seconds and repeating the process 2-3 times. Do NOT stretch immediately before or after a workout – it weakens the muscle. I suppose if you’re not training very often, or very intensely, it won’t matter much, but it will prevent you from getting the most out of your training. Flexibility workouts should be treated as separate workouts, but you can be flexible with them (har har) and do them anywhere – in front of the TV while your favourite weekly show is on for example. If flexibility is central to your sport, then you want to do this twice a week at least, otherwise once is fine. Work on your core. When I say this, people think of abs, and six-packs. That is not quite what I mean. I’m really talking about obliques, and pelvic floor muscles. They are very underworked and underused muscles, yet are some of the most important when it comes to… well… moving. It’s hard to really understand this unless you’ve have a bad back injury. I had a prolapsed disc once, and it really sucked. It also made me realize how much you use your back in everything that you do, from tying your shoelaces, to opening doors. Small wonder then, that when you get to the elite level everyone tells you to work on your core. Of course, EVERYONE should work on their core because everyone moves. Just doing lots of sit ups though, isn’t going to help you very much. You’re aiming to develop the muscles that stabilize you. This is all about having a strong platform from which to jump, throw, run, whatever. A nice one to start with is the “prone hold”, sometimes called the plank, or ab brace. It’s simple – you hold yourself off the ground using your elbows and toes. The key is to keep your back straight and to draw your belly button towards your spine (sucking your tummy in). Start with two or three sets of thirty seconds each. It might take a while, but you should eventually aim to progress to at least two sets of two minutes. I used to be able to do two sets of five minutes every day without much trouble. Another good exercise to add to that, is what I call the “wood chop”. This is where you sit on a medium-sized inflatable fit ball, and perform a twisting action with your arms outstretched drawing a weighted-cable across the front of your body (rather like chopping at a tree with an axe). These exercises won’t necessarily make you look hot in the mirror (with a shirt off), but they will make you biomechanically much more efficient at moving your own body. Intensity is important. I actually have the opposite problem when I work out, I have a tendency to go out too hard and toast myself (which is fine for certain workouts, but not all). This depends very largely on what sport you pick, but it is a good idea to vary the intensity of your workouts. Training too intensely too often will burn you out and injure you. Doing the opposite will make you surprisingly useless at your chosen sport. Take this anecdote – I had a friend, Juan Carlos Valencia, stay with me for a number of months and he would run at least 10k every day. He challenged me to a race once – 800m, and I feel sure that he felt sure that he would win. He spent more time than I did training, and he certainly ran a far greater distance on a regular basis. However, when the day of the race came, I ran on his shoulder for 500m at a pace that I would describe as “uncomfortably fast”, but at 300m to go, I took off and covered the final 300m in the time it took him to cover 200m. I was exhausted, and he was not… but I had won the race by a considerable margin. I was training 5 days a week at the time (I was training for the 400m at university games), and my workouts weren’t long, but they involved a lot more speed work and were done at a much higher intensity (I call it “vomit intensity”). Now just some quick notes on weight training to finish off. Weight training in indispensable if you’re serious about getting anywhere in sport. Even if you aren’t, it’s much more time efficient than simply doing a lot of the sport. Always do a full warm up consisting of at least 5 minutes on a stationary bike or equivalently low-impact apparatus. Start with legs, then chest, shoulders, arms, and finish with your core workout. Even though you don’t specifically target your core until the end, you should always be thinking about what your core is doing when you do all the exercises. Always warm down afterwards, and don’t feel silly if you’re spending more time warming up and warming down than you actually spend working out. Specificity is key. For weight training to really benefit you in the sport that you are doing, you need to be doing exercises which are reasonably specific to the actions that you perform in that sport. In speed skating, that is relatively easy – lots of squats, dead lifts, lunges and other similar exercises. Even then, we were instructed to time our muscle contractions to closely mimic what they would do in skating. For example, we did one-legged squats with a small amount of weight and we would count to three on the way down, but come up using only one count. Does it make a difference? Yes, a very very small one… but when fractions of a second matter so much, these things all add up. I suppose if you’re getting to the stage where you’re designing very specific weight exercises to assist with your sport, then you would (or should) have a coach to assist you. Don’t get obsessed with lifting heavy weights. That’s a high speed train ticket to the land of injury. I suppose the exception to the rule “don’t get obsessed with lifting heavy weights” would be if your chosen sport is weightlifting, in which case, that is your imperative. Otherwise, realize that lighter weights, combined with proper technique and specificity will actually be much more effective in achieving your goals (nebulous as they may be). If you just want big muscles, then the feeling that you are going for is the “burn”. 2-3 sets of 10-15 reps, where the last 2-3 reps are giving you the “burn” is the general formula for muscle hypertrophy. Do these reps slowly on the way down as well as on the way up and you will be more effective. Eat lots of protein immediately after your workout to maximize your recovery. Muscles are a funny thing. They are essential to performance in sport, but many people are surprised at just how much range you have when it comes to training muscles. If your aim is not to simply have big muscles, don’t get obsessed with having big muscles. Bodybuilders are actually very weak. For the amount of muscle they have, they really can’t do much other than look (questionably) good with their shirts off. As far as strength to weigh ratio goes, gymnasts and ballet dancers are the winners, and it won’t surprise you that being from either of those sets of people is a great starting point to get into other sports. But, in sports like shot put, your strength-to-weight ratio doesn’t get you anywhere, only your strengths does, and in speed skating, there is some middle ground. What I’m trying to say is “don’t put on more muscle than you need”. Muscle is “expensive”, you need to feed it, you need to maintain it. When you’re running hard you will hit your lactic threshold sooner if you have more muscle. I guess the point I’m trying to make is that you must always keep in mind what your muscles are there to do. I don’t know if any of this information is useful to anybody, but there it is. Below is a typical week of training program for “general fitness” aimed at a versatile, well-rounded athlete such as a middle distance runner, skater, or curler. I am NOT currently doing any of this, nor do I intend to. If any readers decide to give this a try, I would be very interested in any feedback. The 1000m bike intervals and the 300m runs are the two high intensity workouts, you should ease into them and resist the temptation to go too hard. Delayed-onset muscle soreness is not a myth. Interval run, 8x300m, 90 second recovery, then 15min off, then 400m 100% (For the 8x300m, try to be completely consistent. The first few sets should feel too easy, and last few sets should feel very difficult, but all should be completed in the same amount of time. You should feel ill, like vomiting, after the 400m. Walk a lap, then jog a lap gently to recover. If you’re up to it, have an ice bath and then a warm shower afterwards.) p.s. Skip the 400m run for the first few weeks. I really enjoyed this post! You are so right in saying that working out has to have a goal and should be fun. Practically, the only times I do work out are when I am having fun (kayaking, swimming, hiking, biking, dancing) or someone does the exercises with me to motivate me (physical therapy). Yet, even though I practice all those activities fairly actively, I still find myself definitely not “fit.” I cannot even run a mile without getting completely winded. I think I’d die if I tried your proposed weekly training, but at the same time I badly want to attempt it. As my classes start next week, I will try to fit working out somewhere in between them.